They live in Tulsa but they have also lived in other places because of their father's job. They all have blonde hair. Ike and Zac have brown eyes and Tay has blue eyes. They love all kinds of music especially original rock and roll. They like all kinds of sports especially rollerblading and laser tag. They all like to draw and read. They also like action movies and comedy tv shows. They are homeschooled by their parents. They have written songs almost all of their lives. They started as a group in 1992 by singing at schools, churches, at their father's work gatherings, local restaurants, and at Mayfest (the local fair). They started out by singing acapella but later added instruments. They met their manager Chris Sabec at the South by Southwest Music Conference in Austin. They recorded 2 independent albums, Boomerang and MMMbop. They even auditioned for a Dr. Pepper commercial and got the part but it was never made. They finally were signed by Mercury Records in 1996 and recorded Middle of Nowhere. It was released in May of 1997 and MMMbop became a #1 hit. Since then they have recorded a Christmas album called Snowed In , released a video called Tulsa, Tokyo and the Middle of Nowhere, and released another album called 3 Car Garage. They have been on many tv shows, and on the covers of many magazines. They have many web sites dedicated to them. They have done promotions all over the world. They even went on tour the summer of 1998 and released a live video (Road to Albertane) and cd (Live From Albertane) from it. 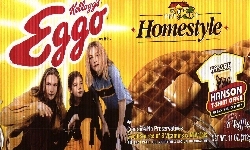 They also made adds for Pepsi, Milk, and Eggos. They also won a MTV World Music Award and an World Music Award. They were nominated for 3 Grammys in 1998. They have played for Arthur Ashe Day and at the World Series, performed at a White House Christmas, made their own Christmas Special, and did Saturday Night Live. In 2000 they released "This Time Around" and went on tour. They also performed at the Rock and Roll Hall of Fame Induction Ceremony in 2000. In 2003 they left IDJ and formed the indie label 3CG records. They released their next record Underneith on that label. They also toured accoustically in 2003. Return to the Hanson Picture Page.